Any racist or obscene posts will be deleted and the poster instantly banned, with their IP address recorded. Spamming, abuse & trolling may result in a ban, as may posters determined to cause trouble or those amending a moderated post. The decision of the moderators is final. It is not acceptable to question or challenge a decision of a moderator. We act fairly and leniently and respect should be shown at all times. Those unwilling to co-operate with this request may find themselves subject to a site ban. The duration of any ban is at the complete discretion of the moderator. We remind you this is a free site and all time is given voluntarily in helping to control the content. Rival fans are more than welcome as long as the above rules are respected. Please keep any arguments off the board, and contact the mods if you need help or to resolve issues. Off topic subjects should contain O/T in the title unless it is clear from the subject heading that the content will be off-topic. Anything of an adult nature should contain either *adults only* or NSFW (not safe for work). Please remember that minors may be viewing the site and all content should observe the laws of decency in the UK. We do not accept SPAM messages or links to other related football sites or commercial sites without permission. Users should only register once and not use multiple ID's to access the site, nor should any attempt be made to impersonate another poster. To add a signature, go to the Control Centre in the top right of the screen and click on 'Edit My Signature. Complete the box on the right of the screen and select Submit. I want to Format my posts. You can change the font size, colour, make it bold, italic or underlined by using the tool bar when writing your messages. These Smart icons add the tags you need and you can either type between them, or type the word, highlight it and click on the icon. The most common mistake people make is when applying more than one 'format' to a word or sentence (eg. Bold and Red) - If attempting to do this, make sure you only select the word you want to enhance taking care not to select the other tags. I want to add an image or a link. Click on the relevant icon and small window appears - some users with 'pop up blocker' and users of IE7 may receive a warning that a scripted window is trying to appear. This is normal and access should be granted. Follow the instructions in the boxes provided and when submitting a URL (Web address) make sure you do not duplicate the HTTP:// that is already pre-populated in the box. Note: To share a picture it must first exist on the internet. If you want to share a picture from your own PC, you must upload it to a free Image hosting service frst and link to it from there (eg. photobucket). 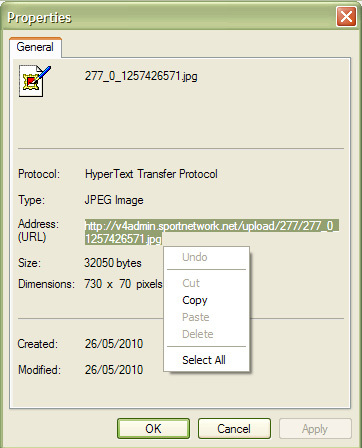 Once your picture exists on the internet, right click on it and select properties, this will give you a grey box which includes the URL of the actual picture. Select and copy this to place in the URL address bar when prompted. Private messages (PM) cannot be viewed by anyone but they can still be reported if abusive! To send a private message, first click on someone's username and add them as a Buddy. Private messages can now be sent to that person from your Private Message Centre. Alternatively, you can send a Private message from within a thread. You can configure if you want to be notified by email when someone sends you a private message through the forum settings in the Control Centre. To see which messages you have and haven't read, look out for the small red New alert on headers and in messages. To jump straight to the latest post, click on 'Last Post' link under the date and time on the right of the board.